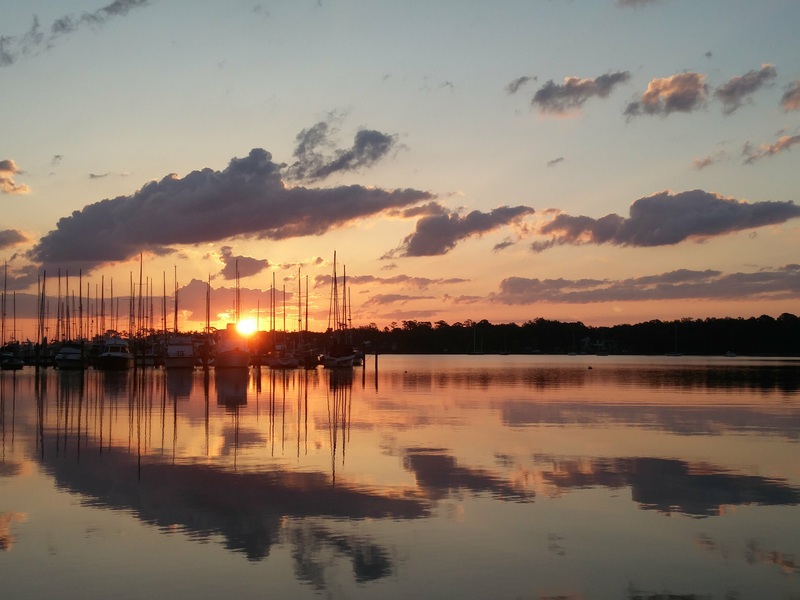 It is obscenely easy to slip into romanticism when writing about life aboard a boat. Lazy comparisons to Thomas Kinkaid’s sweet and soft views of neighboring civilization across the river, lit up with the warm, orangey glow of lamp light. How the boat gently rocks you to sleep each night, banishing decades-old struggles with insomnia. How the sound of steel drums will echo across the water from the marina next door, sweeping away your worries and replacing it with delight, even if only for a moment. We recently crossed a year aboard Star Stuff. (And nobody died!) 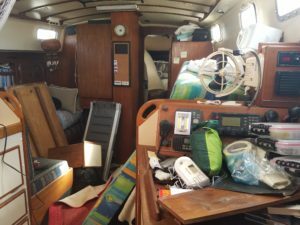 We marked our first anniversary as liveaboards in October and are now more than halfway through our two-year-ish plan before we hope to go cruising full time. It’s the waiting room. A rocking, sweet, irritating, let’s get this show on the road, waiting room. I hate the “in-between”. Once I’ve made a decision, I want to cut to the chase. But, most of the “in-betweens” we experience in this life are forced upon us. The loss of a job, the destruction of a home, a divorce, the death of a loved one, are extreme examples of a “life before” with a “life after”. The demarcation line when you know everything is about to change and there is no map, no guide, and not even a flashlight to make your way to the “other side”. When it’s a traumatic event that’s brought you to the bardo, it can feel like purgatory. It’s beyond a waiting room, it’s limbo. But, I’ve chosen this waiting room. I’m not here on my knees. I’m just a whiny, impatient person that wants to get on with the cool stuff! I want to hike Machu Picchu! I want to go back to Roatán and dive the reef! I want to experience big, blue water! I want to meet like-minded friends with an adventurous streak and a plan! Let’s go already! Are we there yet? No. It’s like being held back a year in grade school. As a yacht broker, I meet and am honored to make friends with some of my clients. Every time one of them leaves and I see them on social media writing about their adventures, or see photos of the beautiful anchorages they find, it makes me feel left behind. And, not just left behind…kinda left out. *Thumps fingertips on the table. Also, sometimes the bardo is really a messy place. Well, you just gotta make the best of it, right? So far, we’ve just been trying to be decent grown ups and keep from doing anything our future selves will want to throttle us for. Financially, it’s been a massively expensive year. On top of multiple-thousands in car repairs, in the last 16 months, we’ve: paid off the car; saved a moderate amount of money; spent said amount on much-needed diesel repairs; paid off the credit card; and emptied the savings account. All expected, planned for, scheduled (except the stupid car repairs) expenses. Greg keeps reminding me that we’re just doing our two-year *cough* five-year *cough* plan from the boat. We’re not really behind. They’re just ahead. So, back to square one. Sort of. I guess we were in a hole to begin with, and now we’re just on level ground. We now have an engine with a rebuilt exhaust system and a new fuel system. So, hopefully that will run like a champ for a good, long while. We still have to pay off the boat, replace the standing rigging, buy a new mainsail, as well as a dinghy, a life raft, and a multitude of smaller gear. And then – then! When that big pile of money is finally saved and spent – then, we can start saving the cruising kitty. And, after that, we can throw off the dock lines and go see some of this world. *Taps fingertips on the table. Anybody want to buy a MC6? Finding meaning as living Star Stuff on this crazy, messy, beautiful blue ball we all share. A Major Milestone: Star Stuff is Paid Off!